The federal minimum wage is normally seen as a labor standard that imposes costs on businesses, and, by lifting up the wage floor, benefits low wage workers. This is an accurate, but incomplete view, however, as it doesn’t show the impact on the federal budget that results from businesses failing to pay adequate wages to their workers. Too often, federal taxpayers are left to subsidize corporate profits through the important programs we have in place to ensure that families can meet their basic needs. When we raise the federal minimum wage, low-wage workers are better able to meet their basic needs, and to contribute more actively in the economy. It’s good for workers, certainly, but we ALL benefit from a more vibrant economy, AND from reduced public benefits costs. The fast food industry provides an important window on the extent to which we all – through our federal tax dollars – are subsidizing poverty level wages. A 2013 study by researchers at the UC Berkeley Labor Center, Fast Food, Poverty Wages: The Public Cost of Low-Wage Jobs in the Fast-Food Industry showed that when wages are too low to provide for life’s basic necessities, it leaves families dependent on public benefits programs – including Medicaid, the Children’s Health Insurance Program (CHIP), Food Stamps, and the earned income tax credit (EITC) – to make ends meet. This report showed that “more than half…of the families of front-line fast food workers are enrolled in one or more public [benefit] programs…” costing a total of nearly $7 billion per year: $3.9 billion through Medicaid and CHIP, $1.0 billion through Food Stamps (now the Supplemental Nutrition Assistance Program, or SNAP), and $1.9 billion in EITC payments. This story repeats itself throughout the low-wage service economy. Workers who earn just above the new minimum are likely to benefit as well. Between eight million and eleven million workers who earn just above $10.10 an hour would be likely to get an earnings boost as their employers adjusted wages scales around the new minimum. All of these increased earnings are likely to be spent in ways that contribute to lifting the overall economy. The impact of the Great Recession continues to be felt acutely by low wage workers. Officially, the recession ended more than five years ago, yet during that time, low wages (wages at the 20th percentile) actually declined in every state but three. Raising the minimum wage is a gift that keeps on giving, creating ripple effects that strengthen our communities and the nation. 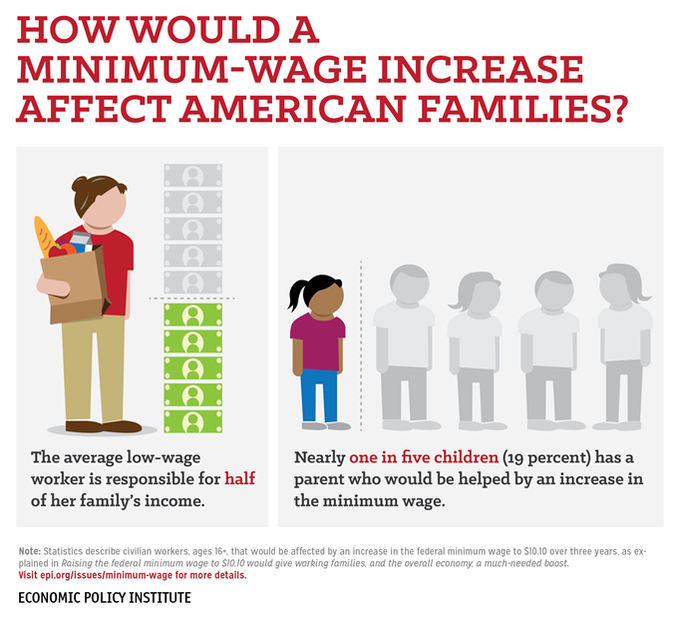 Increasing the federal minimum wage helps the lowest wage workers, boosts wages for those just above the new minimum, infuses much-needed money into the economy, AND reduces the extent to which low-income workers must lean on the federal budget just to meet their basic needs. Surely it’s time to #RaiseTheWage, to show that #WEMatter! [To learn more about who would benefit from increasing the federal minimum wage in your state, click here].